A fundraiser on Wednesday, April 6 will raise funds for relief efforts in Sendai, Japan after the devastating earthquake and tsunami earlier this month. 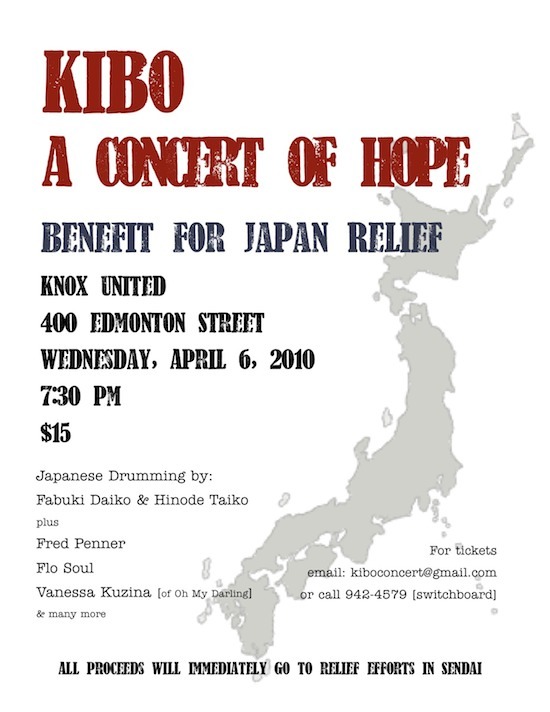 Kibo — A Concert of Hope will include performances by Fred Penner, Flo Soul, Vanessa Kuzina from Oh My Darling and more. Japanese drummers Fabuki Daiko and Hinode Taiko will also perform. Tickets are $15 by e-mailing kiboconcert@gmail.com, or calling (204) 942-4579. The benefit will begin at 7:30 p.m. inside Knox United Church, 400 Edmonton Street.